The GAD67 is kit intended for the quantification of the glutamate decarboxylase 67kDa isoform in cell lysates. Glutamic acid decarboxylase (GAD) is an enzyme that catalyzes the decarboxylation of glutamate to GABA and CO2. GAD uses PLP as a cofactor. GAD67 is expressed in the brain, where GABA is used as a neurotransmitter, and in the insulin-producing ß-cells of the pancreas. GAD67 is a target of autoantibodies that can lead to the development of type 1 diabetes mellitus or latent autoimmune diabetes. Deregulation of GAD67 expression can be associated to Schizophrenia and Parkinson's disease. 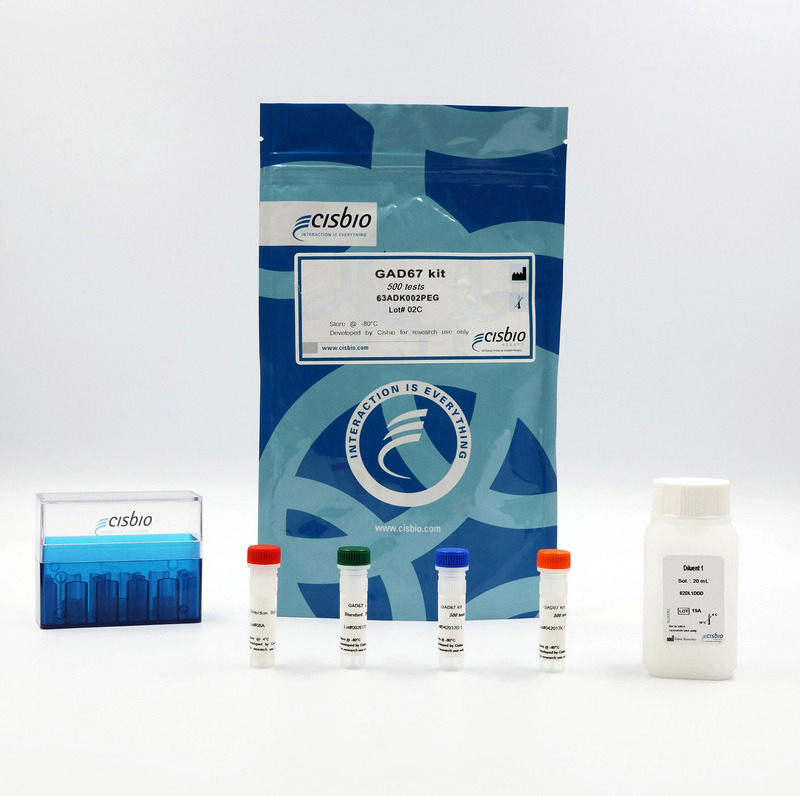 The GAD67 kit enables the fast detection of human, rat, or mouse GAD67 in cell lysates. GAD67 is measured using a sandwich immunoassay using two antibodies specific for GAD67, respectively labelled with Terbium Cryptate (donor fluorophore) and d2 (acceptor fluorophore). The intensity of the FRET signal is proportional to the concentration of GAD67 present in the sample. The GAD67 assay features a two-plate assay protocol, where cells are plated, stimulated, and lysed in the same culture plate. Lysates are then transferred to the assay plate for the detection of GAD67. This protocol enables the cells' viability and confluence to be monitored. The antibodies labelled with HTRF fluorophores may be pre-mixed and added in a single dispensing step to further streamline the assay procedure. The assay detection can be run in 96- to 384-well plates by simply resizing each addition volume proportionally.